In 2010 St Francis Church celebrated its 75th anniversary. The foundation stones of the current building were laid in October 1935 and the new church was dedicated a year later in October 1936. 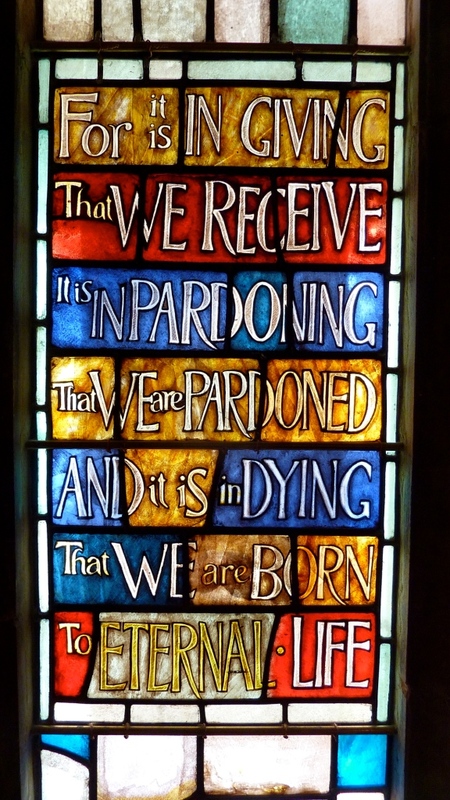 To mark important anniversary the congregation raised the money to install a specially commissioned stained glass East Window. 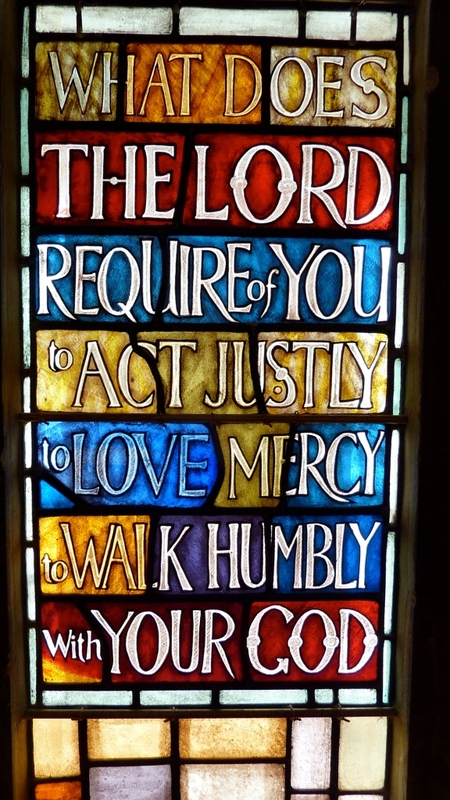 The new East Window was dedicated to the Glory of God by the Bishop of Croydon (the Rt. Rev. Nick Baines) at a Thanksgiving Service held on Sunday 3rd October 2010. We were pleased to be joined at the service by Andrew Taylor, who designed and made the window, the Mayor of Bromley and many friends of the church, including some of those who had been involved in activities to raise money for the window. 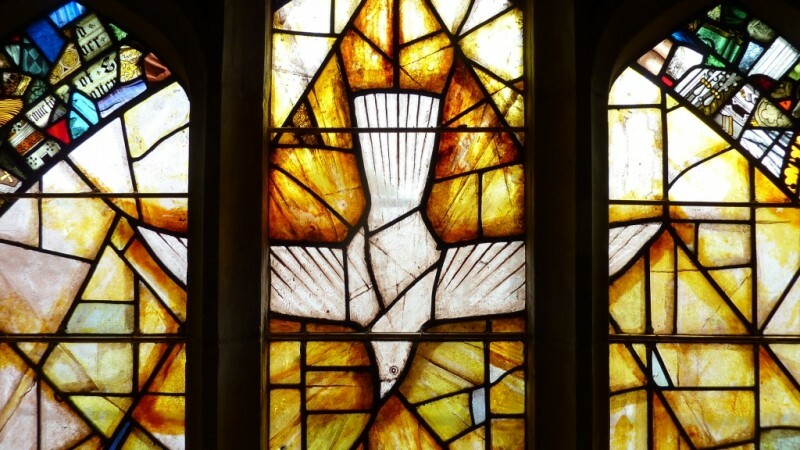 The Bishop praised the stunning workmanship and beautiful design of the window and spoke of its effect to draw us through the images to the reality of Francis’ discipleship - which took Jesus with the utmost seriousness and cost him everything. When starting the design sketches, initially I worked right across the seven lights of the window with coloured imagery, but to keep to a budget I adjusted most of the ideas to contain them in the three central lights. Having looked at notable events in St Francis’ life, mainly described by Thomas of Celano and St Bonaventura and depicted so well in Giotto’s frescoes, I transformed some of these events into glass images for the East Window. 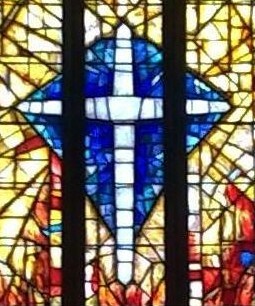 THE CROSS- St Francis’ initial overpowering experience of God communicating with him was in St Damian's Church, where he heard the figure of Christ on the cross speak to him (an image of a modern cross is shown centrally in upper traceries). The vision of Christ conveyed a message that St Francis should restore the church he was in as it was in a ruined state, but the experience also changed his whole life. RESTORATION- To symbolise and give a sense of this Restoration of St Damian's Church, I added a scattering of fragments of old glass around the top of the traceries. 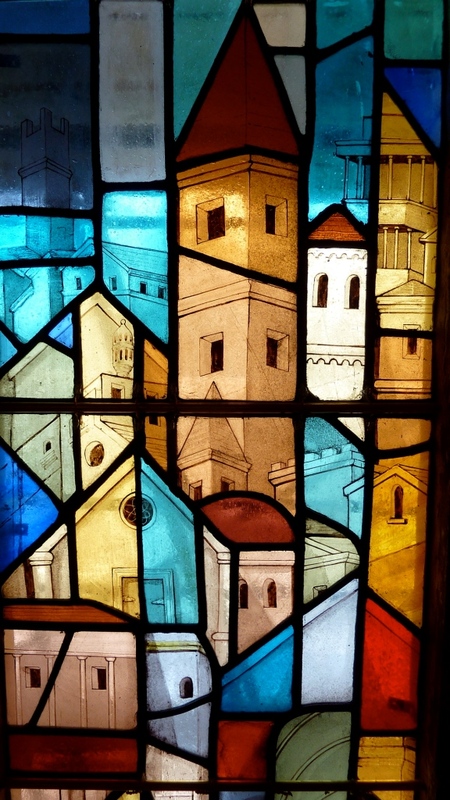 This creates a visual richness and focus in an upward (heavenly) direction and links the refurbishment of the window and church to the time of great transformation in St Francis’ life. 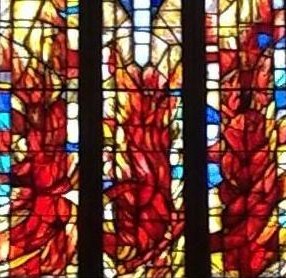 Fire - The upper tiers of lancets are in reds and gold to represent fire. At the outset “Fire” came to my attention; someone described it as a fitting symbol of St Francis’ religious fervour. Fire is also recognised as a symbol of spiritual ‘Transformation’. It links to Pentecost and the Holy Spirit (Dove) and one can make many other associations with the colour red. Vision of Chariot of fire - One night St Francis was praying with some of the brothers while others slept. Suddenly, a magnificent chariot of fire came and swept through the house in a blaze of glory. The brothers who saw it were amazed. The sleepers woke up terrified, but all knew that the Spirit of God had descended from heaven and was present amongst them. On another occasion St Francis also challenged a Sultan to a trial of religions by fire.There are stories in “Little Flowers of St. Francis” that mention fire, particularly when he prayed. The surrounding area would become so bright that people thought the fields were on fire. In the 2nd tier lancets there are some lines and painting to hint at the wheels and movement of a fiery chariot. THE DREAM OF A PALACE - As Francis slept, God showed him in a dream a magnificent palace with thrones and with armour bearing the sign of Christ's cross. Depiction of palace buildings, towers (Giotto style) are shown in the left hand outer light 2nd tier. BIRDS– the well known story of St Francis preaching to a flock of birds. The Miracle of the Spring - One day St Francis was unwell and rode up to his mountain retreat of La Verna on a donkey lent to him by a peasant who followed on foot. Distressed and exhausted by the heat, the poor man pleaded for a drink. St Francis got off the donkey and knelt to pray, whereupon he found water springing from a bare rock. The spring was never found again. Water is a powerful symbol and one of the four elements that sustains all natural life and can be seen in the three central lower lancets. 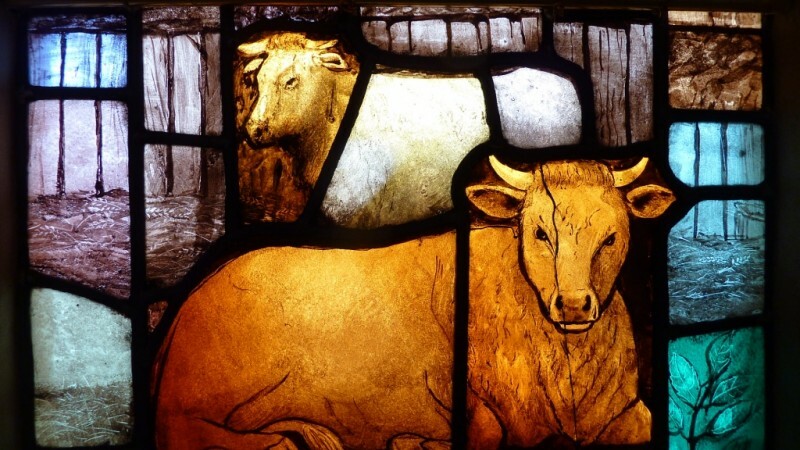 ANIMALS - Representing St Francis’ love of nature - wolf, deer, animal shapes and birds are in the right lower lancet. NATIVITY- the Crib at Greccio, three years before his death. In order to encourage a spirit of worship in ordinary people, St Francis had a crib set up in a cave near Greccio, complete with a manger and a real ox and donkey. He thus started the tradition, which continues to this day, of preparing a crib at Christmas time in memory of Christ's birth in the stable at Bethlehem. The ox and donkey are shown with a thatched stable structure integrated in the left lower tier.